A new solar-powered rover will study ice floes in Greenland. After engineering vehicles that drop from floating rocket platforms and travel autonomously across alien worlds, NASA is ready for the next great frontier: Greenland. It's taking its latest rover out for a spin up towards the apex of Greenland's icesheet, where researchers can study ice and snow from a place that isn't Greenland. Called Grover (for Goddard Remotely Operated Vehicle for Exploration and Research), the vehicle comes in at 6' and 800lbs. An arctic environment where the sun shines 24 hours a day (in the summer) is perfect for the solar-powered rover. Starting May 3rd, Grover will continuously roam the arctic climes of Greenland until finishing on June 8, which sounds like a hell of a summer vacation. 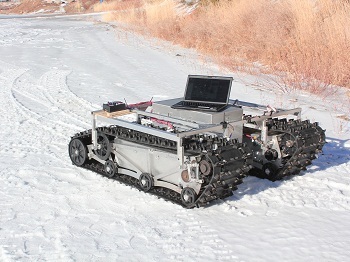 The picture here is of a Grover prototype without its solar panels that the team tested at a ski lodge. For its icy mission, it will be equipped with ground-penetrating radar that bounces radio waves under the ground and help researchers identify characteristics of the various layers of snow and ice. By studying Greenland's snow accumulation, they hope to calculate how much of Greenland melts into the sea every year. Its vast ice sheets contain an enormous amount of fresh water, and idea is to find out how much that might be affecting the creeping sea levels. Last year, NASA used aircraft to determine that Greenland's ice loss is accelerating at 22 gigatons a year. "The fact is the robot could be anywhere in the world and we'll be able to control it from anywhere," said Gabriel Trisca, one of the students who helped develop Grover's software. I'm assuming that she means that the Grover team will be stationed in a nice tropical location, where they can scan ice floes while ordering drinks on the beach.